Saab 9-3 ePower | What Car? This all-electric 9-3 Sportwagon is the star of the Saab stand at the Paris motor show. Called the ePower, its a prototype for a test fleet of 70 cars, which will be built and trialled in Sweden early next year. 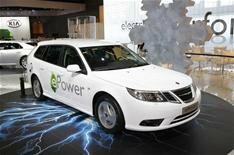 Its Saab first ever electric car, and is the product of collaboration between Saab, Boston Power (for the batteries) and Electroengine in Sweden AB (for the powertrain). Based on the BMW 3 Series-rivaling 9-3, the ePower is, erm, powered by a 181bhp electric motor, which drives the front wheels through a single-speed gearbox. Instant maximum torque means a 0-62mph time of just 8.5 seconds, and top speed is a respectable 93mph. The ePower has a projected range of around 124 miles, which is pretty impressive by todays EV standards. Key to the longer range are the battery cells, which have an unusually high storage density. Another reason is the use of air rather then liquid cooling. This contributes to lower cost and also saves weight. The battery pack is designed to support recharge cycles equivalent to that of 10 years use. It can be fully recharged from a domestic mains supply in six hours.